This acrylic serving set complements any table setting. Lightweight serving pieces are easy to transport and ideal for both indoor and outdoor use. You can use this as a standard chip bowl with salsa in the dip bowls, as a salad bowl with a choice of dressings in the dip bowls (dressings on the side keeps salads crisp), strawberries and chocolate/cream as a dessert etc. 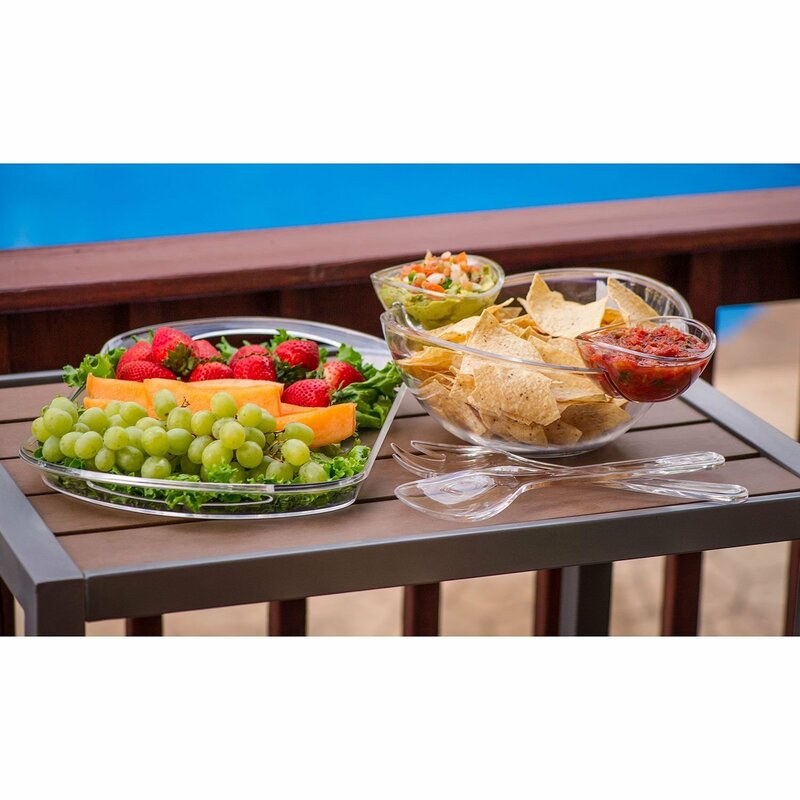 Chip And Dip Salad Fruit Bowl Serving Tray-Large tray holds appetizers for a crowd, or can be used to transport drinks, utensils and more. Small bowls hold dip or dressing -- use separately or clip onto large bowl. Large bowl is ideal for salads, chips or snacks and comes with matching serving fork and spoon. This set comes complete wtih two serving utensils (serving fork, serving spoon). The is the perfect serving set for parties, picnics or every day use. 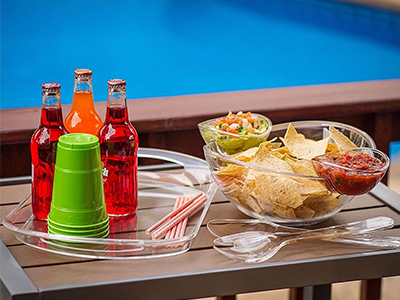 Large tray holds appetizers for a crowd, or can be used to transport drinks, utensils and more. Small bowls hold dip or dressing -- use separately or clip onto large bowl. Large bowl is ideal for salads, chips or snacks and comes with matching serving fork and spoon. This set comes complete with two serving utensils (serving fork, serving spoon). Separate your favorite chips, snacks, and dips for your guest to enjoy. This decorous gracious dining three piece chip and dip plate server set is composed of three fine acrylic chips and dip set.chips and dip set is dishwasher safe. Ultra light. Hand wash only. Top-rack dishwasher safe. 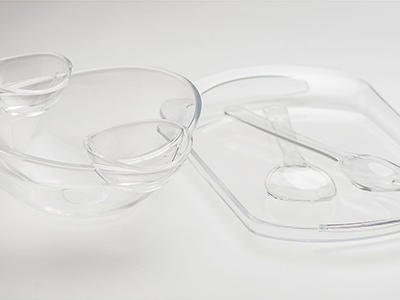 Unique high-quality, high-clarity, easy to hold chips and dip set generous sized chip bowl. Matching attachable dip bowls balance brilliance and strength. It will definitely bring classic to your table every day and make any occasion a special one. 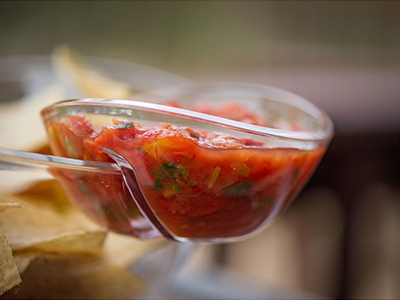 Use as one set for your favorite chips/salad and dips or as three individual bowls. You can use this as a standard chip bowl with salsa in the dip bowls, as a salad bowl with a choice of dressings in the dip bowls (dressings on the side keeps salads crisp), strawberries and chocolate/cream as a dessert etc. Perfect for serving and entertaining for any occasion. It will enhance any party and is perfect for indoor and outdoor entertaining. Elegant and versatile design. Ideal for daily use, restaurants, hotels, parties, birthdays, barbecues and family gatherings etc. Nice Serving Set, Good quality, Great price. This has been a great combination of serving pieces for our camper where space is at a premium at a great price. I recommend it wholeheartedly! Great value. I bought same product at a higher price, but this is just as good.